The meeting will also host the 2013 FBA Draft Lottery to determine the final draft order for the 2013 FBA Draft, scheduled for early October. The meeting can be watched on LiveStream. A perennial champion, the #4 Dakota Bikers have won the Western Conference Championship for the second year in a row and the fifth time in ten seasons. Fueled by fresh offense from the acquisition of Buck Hopper (Rabbit, G), formerly of the #5 San Jose Thrust (42-38), the team overcame early struggles before their success. A run of injuries began with rookie Daniel Quvianuq (Polar Bear, C+) who blew out his knees in a pre-season game, followed by Doug Bentham (Weasel, G+) breaking his wrist during a mid-season match. Despite the injuries, the Bikers found a playoffs berth and survived the first two rounds in seven games each, first defeating the Thrust then the Midwest Division winning #1 Winnipeg Voyageurs (64-16). The grueling 14 matches was followed by a quick four game sweep of the #7 Edmonton Totems (36-44) who made league history by being the first team to reach the conference championship in their inagural year. The #1 Tallahassee Typhoons have reached the Finals for the first time in franchise history after a dominating regular season where they won their division and the conference. Having never gotten past the first round in previous post-seasons, the Typhoons took the opposite road from the Bikers, first sweeping the #8 Plymouth Taproots (32-48) before struggling past the #4 Biloxi Voodoo (64-16) then the #2 Newark Pride (54-26) in six games each. Fueled by the strength of the "Dawg Pack"—Klaus Korber (Doberman, G), Jake Velox (Swift Fox, G) and Charles Yotechuk (Coyote, F)—and guided by a stunning performance from new head coach Tazel Tawner (Vixen), the Typhoons secured homefield advantage in the Finals series and the confidence of analysts at being able to defeat a team well experienced in the Finals. FBA Courtside: LIVE! is a live audio-only podcast featuring commentary on games simulated for the Furry Basketball Association. Games are simulated using 2K Sports' NBA 2K13 on Xbox 360 with custom players and teams. T. Matt Latrans (Coyote) announces the live play-by-play for all four 12-minute quarters with guest color commentators calling in through Skype. Live audio streams are broadcast using Mixlr. 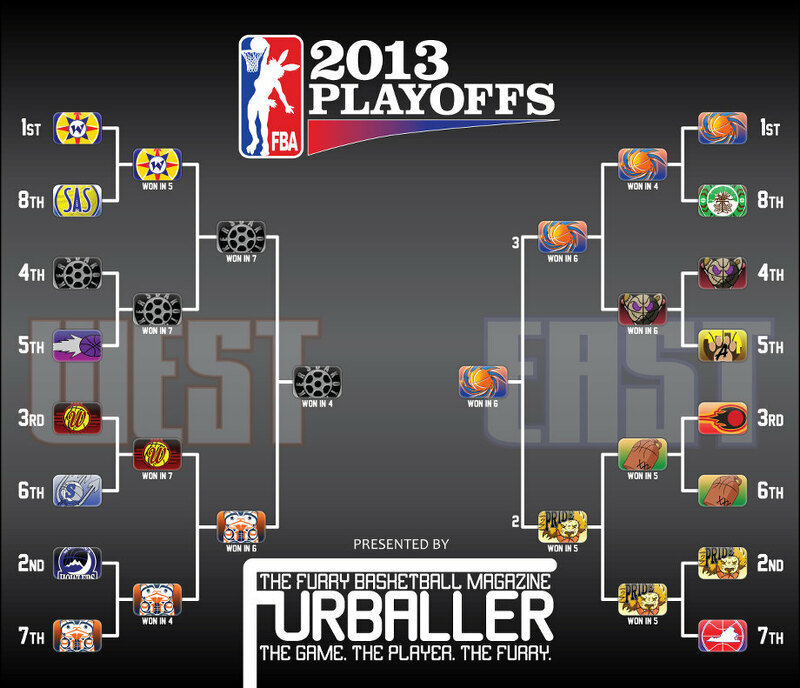 The entire season of episodes will be made available on SoundCloud following the end of the 2012-2013 FBA season. Questions regarding the Furry Basketball Association or FBA Courtside: LIVE! can be sent to the FBA Commissioner at fba@furrybasketball.com. "The Pride lost the Semi-finals."